The Asia House Bagri Foundation Literature Festival starts in London today, and continues until Friday, May 26. This is the only UK-based literary festival dedicated to discussing writing about Asia. It takes a pan-Asian approach including books from Turkey in the West, to the Philippines in the East. Writer, journalist and translator Hande Eagle is the Literature Programme Manager at Asia House. She is responsible for organising the Festival. Hande is a Turkish national, who has been a long-term resident of the UK. She only started her job in January, when “half of the Festival had already been organised and I had to absorb everything in the blink of an eye.” She here answers questions about the upcoming Festival. 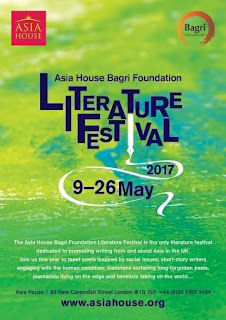 How did you become involved in the Asia House Bagri Foundation Literature Festival? After graduating from a UK university, the University of Leicester, with a BA in Sociology, I worked in HR at a multi-national medical company. After some time, I realised that this really wasn’t the career path I wanted to go down. So, I moved back to Istanbul in 2008 and started soul-searching. I had started writing at a young age and I wanted to write. I was interested in literature and art and as part of that, having lived in the UK as a Turkish national for over ten years, I was also interested in translation. So, by taking small steps, I entered the world of publishing. At first I worked as an Assistant Editor at a prestigious art magazine, and later decided to become self-employed and direct my own translation and editorial business. Towards the end of 2009 I was invited to write for the arts and culture pages of Cumhuriyet, a Turkish national daily established in 1924. This was something I had dreamt of since I was a little girl because I am from a progressive family who very much admired Cumhuriyet’s stance towards social life, culture and politics in the 1980s and 1990s. I wrote for Cumhuriyet for five years. Meanwhile, in 2012 I moved back to the UK and continued to work with numerous publishing houses, private art institutions, magazines and newspapers in Turkey and in the UK. Over time, I felt that I needed something more. I wanted to be involved in events organisation and in working on different ideas with a team, to add a new aspect to my career and also be more engaged with people. I had known about Asia House for a couple of years when I applied for the position of Literature Programme Manager at the end of 2016. I was both excited and intrigued by the idea of managing the only pan-Asian literature festival in the UK. It’s fantastic that you were hired, but how did you feel about being thrown in at the deep end? At first, there was a huge amount of information to take in. On top of that I had to add events to make the Festival more diverse and engaging. From the design process to the marketing, working with the team at Asia House has been an amazing adventure and an invigorating challenge. When I look back now, I feel like I have been working on the Festival much longer than four months, but I must say I’ve been very, very lucky to have the support of an amazing team. Is there an official theme this year? Coming into this position four months before the Festival meant that I had to work around the events that had already been planned. I wanted to bring out a few important points. I wanted the design of all our printed and online materials to resonate a sense of openness, peace, compassion and freedom. In this time of political and economic instability, I believe this is the most appropriate message we could convey. We also wanted to connote the geography of Asia in an abstract way. I didn’t want to associate the Festival with a specific country in Asia but the whole of Asia. On top of that, I wanted to give more place to women writers and although when I was drafting the contracts for the events I wasn’t thinking “Great, another female writer in the list”, I was being swayed by the quality of their work. No offense to men! Which countries are covered this year? To us, being a pan-Asian literature festival means including as many Asian countries and histories as possible in our programme. From 13th century Persia to contemporary Pakistan, from growing up in a changing China during the Cultural Revolution to going undercover in Pyongyang, from the war in Syria to life in Beirut and the Partition of India we have a line-up of highly engaging events featuring some of the best writers of our time: to name a few Christina Lamb; Elif Shafak; Aamer Hussein; Lijia Zhang; Nadeem Aslam; Miguel Syjuco. What is the rationale behind holding a pan-Asian festival, rather than festivals devoted to more limited areas - say, Korean literature, or literature from Indonesia? Founded in 1996 in London by a small group of Asian art specialists, keepers, curators, and art gallery owners, under the direction of former diplomat and arts administrator Sir Peter Wakefield, Asia House is a centre of expertise on Asia. Following in Sir Peter Wakefield’s footsteps, we are passionate about the arts and cultures of Asia, and about promoting them here in the UK. Given our vision and mission, we are dedicated to making sure that the Asia House Bagri Foundation Literature Festival is as diverse and as inclusive as possible. Bringing Asia together through literature is a wonderful way of uniting people and introducing Asian literature with all its flavour. However, having said that, we are also fortunate enough to be able to organise country and city-specific events throughout the year. For example, as part of this year’s Festival we organised a series of six events titled, Sin Cities: Vice and Virtue Across Asia’s Urban Landscapes, generously sponsored by Cockayne Grants for the Arts. The first two events were on Bangkok and Indian metropolises. We are looking forward to the upcoming events on Shenzhen, Beirut, Pyongyang and Manila over the next few weeks. Sin and vice could be controversial. In London, you enjoy free speech. Is it part of Asia House’s remit to promote free speech in Asia? If so: how is this being done in Asia itself? Freedom of speech and freedom of expression are crucial to us. One of our key aims is to provide an objective and respectful platform for all. We like our speakers and audiences to express themselves at our events and flag issues that are both of concern and of interest to them. We provide a platform for free speech, and it’s up to our writers and audiences to take the opportunity to express themselves. We promote freedom of speech globally with the content of our events. In a new initiative, we are now filming all our events, so people will be able to watch them from anywhere in the world. Free speech aside, what does being in London add to the discussion? London has been one of the most vibrant, culturally and socially wealthy cities in the world throughout history. It holds the pulse of time – the city itself is like a hotel reception with old analogue clocks showing the time in the different zones across the world; Beijing, Paris, New York. As a cosmopolitan city of immense diversity and wealth of knowledge, London has managed to keep its status as a world city and build on that prestige for hundreds of years. In London there is a place for all and we like to welcome everyone. Who is the Festival aimed at? Are you expecting the audience to be drawn mainly from Londoners of Asian descent? We are keen to see young people and students at our events but the Festival is aimed at everyone. If you have an interest in literature and reading, if you want to learn something new, if you want to hear other perspectives and engage with different people, our Festival is the one for you. We are expecting the audience to be from anywhere and everywhere. Do you have any plans to hold the Festival somewhere in Asia, one day? It would be amazing to have the opportunity and the resources to expand the Festival to overseas. In my view, it could one day be organised in Asia or even in Latin America…Uniting people and continents through introducing their literatures to one another’s would be a rare privilege. Do all the books you feature have to be published in the UK? Do they have to be available in English? They don’t have to be published in the UK but they need to have been published in English. Do all your invited authors have to speak English? No, sometimes we use the services of an interpreter. Which translated titles are you featuring this year? On May 17, Turkish journalist and novelist Ece Temelkuran will be launching the English translation of her book, Düğümlere Üfleyen Kadınlar (Women Who Blow on Knots) translated into English from Turkish by Alexander Dawe. On May 25th, we will be welcoming German Middle East expert and journalist Andrea C. Hoffmann for a conversation with British Middle East expert and writer Diana Darke. They will be talking about Andrea's non-fiction account of a Yazidi girl's amazing escape, The Girl Who Beat ISIS, which was translated into English from German by Jamie Bulloch. How did you choose the titles in translation? It is important that the work is current and relevant with the zeitgeist: it has its own unique air; it has its own soul. It needs to read well and carry me away. That doesn’t happen with every translation; it’s rare. That’s why translation really is an art. You worked as a translator, so I assume you are keen to incorporate more events on translation? Yes, of course! Although for this year’s Festival it wasn’t possible to put together many panel discussions on translation in the timeframe we had, I am working on welcoming translators to our future events. Are you worried at all about the dominance of English in a Festival of Asian literature? No, I am not worried because we have readings in the original language as well as in English when it is applicable. For example, during one of our pre-Festival events we had the opportunity to listen to the poetry of Nikoloz Baratashvili, otherwise known as the Georgian Byron, in Georgian, from Donald Rayfield who also translated the poems into English. On June 30, we will be presenting a post-Festival event, Carrying Poems Between Languages, in partnership with the Poetry Translation Centre to showcase the work of Karin Karakaşlı, one of the best contemporary poets from Turkey. I don’t share the opinion that language solely makes up literature; there are many components to literature and what makes it Asian is not necessarily the language it was originally written in but its feel, the whole culture behind it, the author’s intellectual and emotional experiences and processes, lifestyle, etc. We will continue to develop a programme that provides a platform for translators, as without them, we would be truly lost. Which events are you personally looking forward to most, and why? I am excited about all of them but I would have to say that I am slightly more excited about two of our events: The Girl Who Beat ISIS and Reflections on the East Asian 20th Century - with Min Jin Lee, author of Pachinko, the highly-acclaimed multi-generational novel of a Korean family in Japan. Both featured books are incredibly emotive accounts of pain, suffering, love and liberation in two totally different times and countries. I am ecstatic about seeing kids enjoy our Asian Shadow Puppetry Workshop. I am also delighted to have the opportunity to offer adults a highly-entertaining Comedy Night. Laughter is important; it’s what keeps us going. I know you work in partnership with publications in Asia, can you give details. Yes, we are in partnership with the Asian Review of Books and with the Asia Literary Review. We promote them, they promote us. As we say in Turkey, “Bir elin nesi var iki elin sesi var”, meaning “two heads are better than one” … Well, in this case it’s three heads! Following the Festival from Asia. Readers in Asia can visit the Asia House website to explore their past, present and future events, or follow their social media accounts: Facebook; Twitter; Instagram; YouTube. Search for them under asiahousearts, or Asia House.